Did you know that if don’t have a crystal clear idea of who your customer avatar is, your online boutique is 81% more likely to fail? The foundation of any solid marketing strategy starts with creating your ideal customer avatar. – Content Marketing – What blog posts, videos, or contests should you create to attract and engage your definition of your ideal customer avatar? – Paid Traffic – What are the right advertising platforms for you? – Product selection – What exactly is your ideal customer looking for and how price sensitive are they? – Copywriting – How should you describe offers in your email marketing, advertising, and product pages. – Email Marketing – Which customer avatar should receive a specific email marketing campaign and when? So now we’re agreed that having a customer avatar is pretty much non-negotiable (especially in today’s competitive online market place), we should probably dive in to how you create one. Yep! You guessed it, they all mean the same thing! But for the sake of this article I’ll be using the term ‘customer avatar’. Now, there are no shortage of online store owners who, if asked whom their ideal customer avatar is would say, “women from 25-45. One the odd occasion, you’ll get one who has dug a little deeper, and they’ll say “mother’s, interior design fanatics, high heel addicts.” And while this is a great start, they’re still fishing in the ocean. See, when it comes to online boutique success specificity is key. And when you have a crystal clear idea of who your customer persona is, not only do you get better at branding and marketing. But you’ll get more data on your customer’s desires, so you can supply them with what they want to buy. I find it helps to break this down into sub-segments of existing markets – especially those markets where you know your product would be a perfect fit. Next, you need to go even further and determine whether that sub-segment is willing or able to buy? Get this evaluation wrong, and your business is inline for some financial trouble. 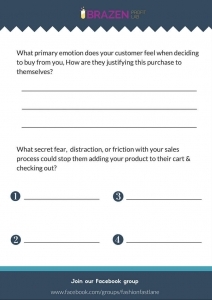 **FYI, there’s space to fill all this information in on your free customer persona worksheet. Now considering this is such an important task, I also thought you’d benefit from my little explainer video. Watch time: 7 minutes. Simply put, this is a unique set of personal characteristics which your ideal customer avatar commonly share. But it’s important to mention that when you start to dig into how your product will suit their lifestyle and meet their needs. You’ll also have a much better idea of how they’re searching the internet to find the answer to those questions. This alone is worth its weight in SEO optimisation GOLD! So that’s it on how to create a customer avatar worksheet, what next? Well now you need to evaluate and analyse the data, so you can feed this insider knowledge into your product choices, website design, brand voice – everything really. Essentially, it’s your secret customer attraction (and retention) weapon. That’s why if you can’t say (without hesitation) that you know exactly who your target customer is, what motivates them, and what they want to buy? 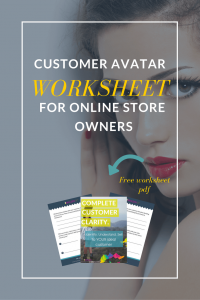 Then you NEED to download your FREE customer avatar worksheet as it’s a great place to start.